This chapter is devoted to introducing the concept of residential mortgage-backed securities (RMBSs). The discussion begins by introducing the nature of asset securitisation and explaining the contemporary market for RMBS in Australia. 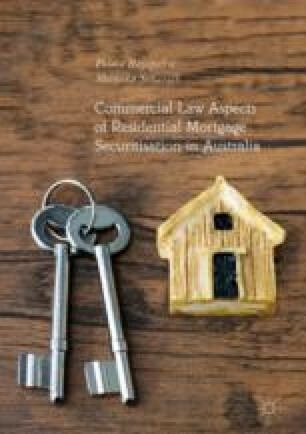 This chapter engages in a quick glance at the financial benefits of asset securitisation, especially RMBS, while explaining the basic structures of RMBS programmes. The rest of the chapter explains the mechanism behind an RMBS programme by utilising a real-life RMBS programme, incorporating diagrams as required. The chapter also explains the objectives, scope, structure, and the contribution of this book. National Competition Council, National Competition Principles Agreement, 11 February 1995, http://www.ncc.gov.au/publication.asp?publicationID=99&activityID=39 (20 January 2002). Queensland Treasury, Public Benefit Test Guidelines: Approach to Undertaking Public Benefit Test Assessments for Legislation Reviews under National Competition Policy, Brisbane, October 1999, http://www.treasury.qld.gov.au/office/knowledge/docs/ncp/public-benefit-test-guidelines.pdf (20 August 2003).